Our State of the Nonprofit Sector Survey is a widely cited barometer of US nonprofits' programmatic, operational, and financial health. THE 2018 SURVEY RESULTS ARE LIVE! Visit the Survey Analyzer to explore the full data set. NFF is deeply grateful to the thousands of nonprofit leaders who took the time to complete the Survey and show the country what's at stake, and to the hundreds of partners who helped share the Survey and build this critically needed data set. Gathering, analyzing, and sharing data about nonprofits' health and challenges is a major pillar of our commitment to unlock the potential of mission-driven organizations by sharing accessible insights. 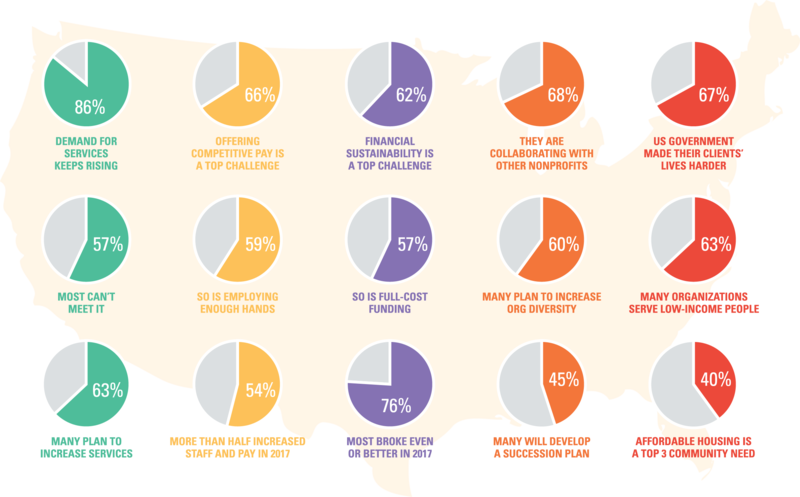 Launched in 2009 when economic crisis threatened the viability of many organizations, the Survey has become a collective megaphone for thousands of nonprofits nationwide, and a crucial evidence base for sector funding discussions. Click here to read the State of the Nonprofit Sector Survey press release, and click here to read an article about the Survey published in The Chronicle of Philanthropy. Read more on how Survey data was used in city council testimony to help NYC nonprofit leaders campaign for better government contracts. When a Korean church lets us give a presentation about mental health, that’s a big win, and sets a foundation for services down the road. There are reasons why our community is underserved: language barriers, cultural stigma, unfamiliarity with the American system, and, sometimes, immigration status. You’ll never reach them if you just care about serving the greatest number of people for the least amount of money. Funders need other ways to think about what success looks like. In Los Angeles, if we could collectively serve all of the marginalized communities of color, we’d reach most of the county. Email survey@nff.org for questions, historical data, and deeper analysis options (charges may apply). NFF thanks the Bank of America Charitable Foundation for generously supporting the State of the Nonprofit Sector Survey since 2010. The 2018 Survey is also generously supported by The David and Lucile Packard Foundation, BKD CPAs & Advisors, and Asian Pacific Community Fund. Our Survey Analyzer lets you compare the data across focus areas, geographies, nonprofit size, and other criteria, and download customized charts for your presentations.